This page contains engines and cars from the Soviet Union that we currently have in inventory. Note that accessories are located on our Soviet Union Accessories web page, miscellaneous items (including reproduction copies of the Set Box Artwork) are located on our Other Soviet Union Train Items web page and complete sets (if any) are located on our Soviet Union Sets web page. * * * Click on "Yes" in the Photo column to see a picture. * * * Click on "Grade" in the appropriate column heading for an explanation of grading. SOLD All-metal, illuminated, Khrushchev-era Soviet Coach with doors that open and latch. The frame is black and has cast wheels. Yellow-green roof and sides with silver trim around the windows and three thin silver stripes along each side. Gold, heat-stamped Soviet emblem on the sides. Dated "69-2" on bottom of car. Photo of the other side. Some paint loss around the latch on one of the doors; the rest of this car is spectacular -- very, very clean with nice vibrant paint and strong markings and it does light! One of the nicest K-era passenger cars we have ever had! Our Archives Page has more information on Soviet passenger cars. 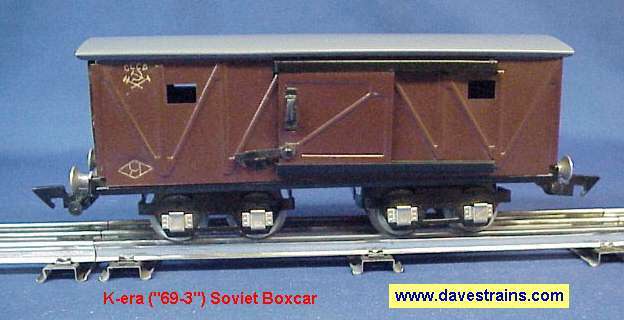 SOLD All-metal Khrushchev-era Soviet Boxcar with sliding doors and latches plus cast wheels. The sides are brown with the Soviet emblem and Khrushchev-era markings heat-stamped in gold. Dated "69-3" on bottom of car. The frame is black and the roof is light-gray. Some paint loss around the bottom door guide on one of the sides; the rest of this car is spectacular -- very, very clean with nice vibrant paint and strong markings. One of the nicest K-era boxcars we have ever had! 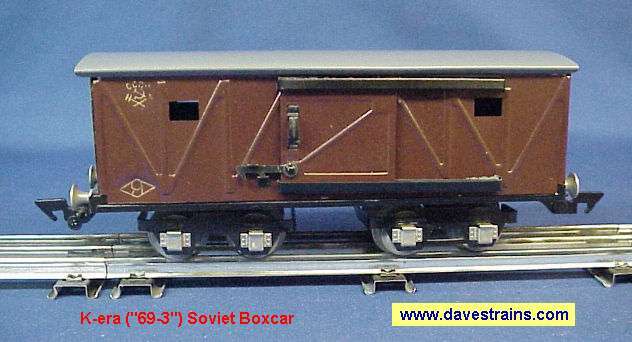 Our Archives Page has more information on Soviet boxcars. 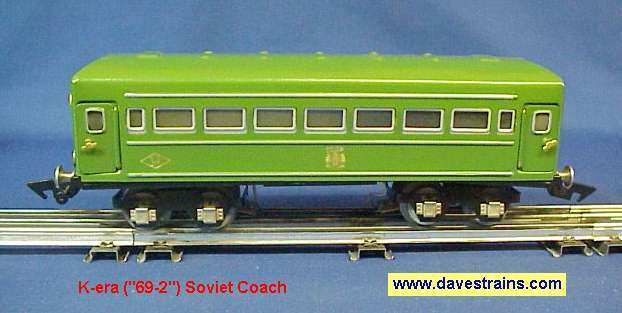 SE553PC Passenger Car VG- Yes SOLD All-metal, illuminated, Stalin-era Soviet Coach with doors that open and latch. The frame is black and has cast wheels. 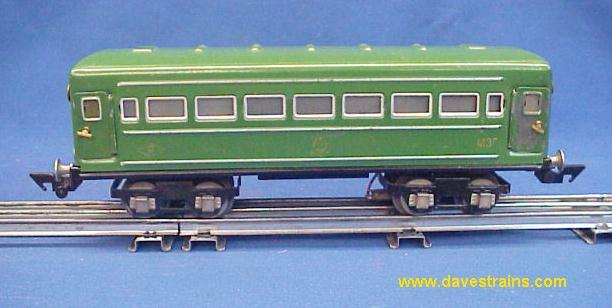 The roof and sides are yellow-green with silver trim around the windows and three thin silver stripes along each side. Gold, heat-stamped Soviet emblem on the sides. 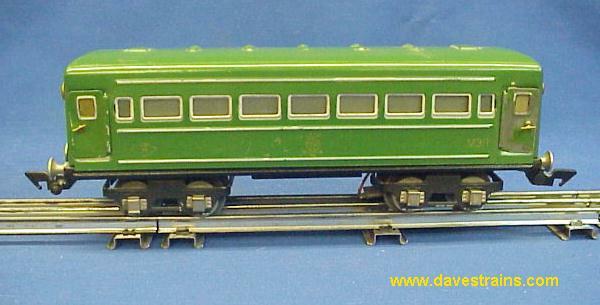 Car is dated "55-3" on the frame and the "MEP" on the sides clearly identifies this coach as a Stalin-era piece. Significant paint loss on two of the doors plus various scratches and paint chips in some spots. Markings are weak but definitely readable. Fairly clean overall and it does light!